Jack Tadych pins his Grandville opponent to cap off the team win. 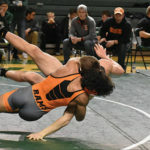 On Friday evening at West Ottawa High School, the O-K Red held the individual conference tournament. Hudsonville earned the outright championship, scoring 215.5 points to Rockford’s 156. “We didn’t come through like we needed to. Some of our wrestlers had disappointing nights,” Richardson admitted. “This conference is one of the toughest in the state and to place here is quite an accomplishment.” The Rams did have several impressive performances. Both Jack Richardson and Noah Anderson were crowned champions. This was the third title for each of the juniors, setting up the possibility for them to become four-time conference champions next year. 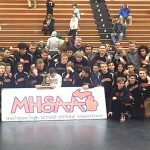 The last time the Rockford wrestling team had that was 2010. Two freshmen, Trenton Wachter and Cole Gleason, both earned berths in the finals, falling short of the win. Connor White and Ashton Halland also finished second in the conference. With the regular season completed, the team is eager to start the postseason. It will host team districts on Wednesday evening at 6 p.m. The Rams will take on the Rangers from Forest Hill Central to determine the team district title. 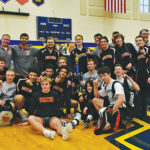 Then on Saturday, they will travel to Grand Haven High School for the individual district tournament, which is the first step toward the coveted state tournament at Ford Field in Detroit.